Detailed in a developer session on Wednesday, "Play Media" is a new Siri intent that allows users to control the playback of media in third-party apps, reports TechCrunch. Currently, Siri can open streaming apps, but is unable to play songs from third-party sources. Part of iOS 12's Siri Shortcuts feature, developers can integrate "Play Media" to provide users voice assistant controls to play audio and video from non-Apple apps. Whether the intent allows for deeper functionality, like pointing directly to a specific song or playlist, remains to be seen. Also unknown is how the feature works on HomePod, a device that restricts native audio playback to Apple Music and Podcasts. "Play Media" was shown off during Apple's keynote on Monday. when Apple product manager Kim Beverett used the app's drag-and-drop editor to add the action "Play KQED Radio" to a customized Shortcut called "Heading Home" which, among other intents, commanded Siri to query Maps for a navigation route, send a custom text via Messages and set a home thermostat. The Shortcuts behavior package is at this point limited to step-by-step actions, meaning "Play Media" is likewise restricted to one-off commands like the "Play KQED Radio" example provided in Apple's keynote. 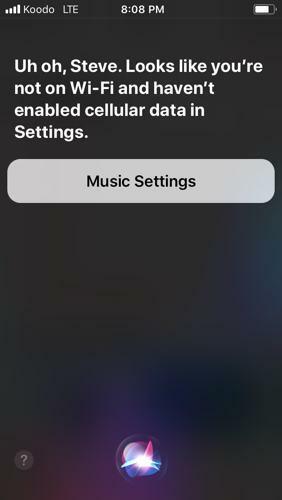 Once the music is playing, however, Siri can fall back on existing capabilities to skip tracks, pause and perform other audio management tasks. Siri integration with Apple Music is of course much more robust. Users are furnished with voice alternatives for nearly every control accessible via the app's onscreen interface. Still, the new intent's inclusion suggests Apple is slowly moving toward a more open experience, one that embraces third-party streaming apps that compete with its own services. It is now up to developers to take advantage of the platform. Hmm, I haven't had much luck. I wonder if I could use Siri automation to do something simple like play my favorites playlist while driving (something I can't currently do). Odd. I just asked Siri specifically to play on of my playlist and she did. This was a voice control feature available on iPods before the Iphone was even released. Not sure what you are doing differently. So do you have to set up a shortcut or do the media apps have to do something to make it work? Right now the only way to add a shortcut is via the Workflow app which has limited actions. I say, “Play my favorites mix” all the time and have never had an issue. It works exactly as expected for me. I’m curious how the shortcuts will work. From the keynote it wasn’t clear if an app could have multiple shortcuts assigned to it. The example was the woman ordering her usual coffee. But what if some days I want my usual and other days I want to order my usual and my wife’s usual? Can that be set up? And as you mentioned, do developers have to do more than just add some hooks for Siri? And could they set up “pre-made” shortcuts? 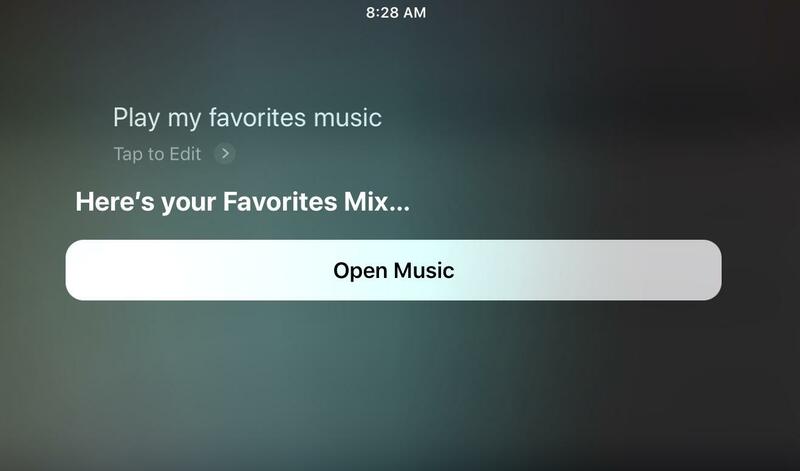 I asked Siri to play my favorites mix (one of the built-in smart playlists) and it completed the request. Siri is so much smatter then eh? I hope she says "Well ok but Apple Music is so much better." One thing I've noticed since all these great new updates (I am especially loving paired HomePods and integration with apple TV and Atmos) is my iPhone answers along side HomePods when I as a question, never had this before. Not sure how to stop this. I want... "Hey Siri, set Hulu to CNN." Or, "...Play latest Westworld on TV." It looks like full 3rd party support for music, TV, movies, podcasts, and audiobooks is coming. It would require developers to implement the new domain, but this seems like something they would be quick to jump on. This seems like such a big deal that the fact that it didn't make the keynote makes me skeptical about it coming out at launch for iOS 12. Might be a 12.3 kind of thing?? "Currently, Siri can open streaming apps, but is unable to play songs from third-party sources." Apple Insider at least should be able to get this right. You can play songs from third party sources just not initiative them. Once they are airplaying you can control volume etc by voice. Wow I’m surprised this wasn’t mentioned in the keynote. They did mention 3rd party maps support for CarPlay. Then I just get this. I've combed the settings and while I don't have every possible Music related cellular-data setting turned on (and I don't intend to turn on the ability to download everything via cellular), it has what it needs turned on, as I can manually start the playlist just fine and play all the tracks in it (they are all local).